Hopefully, something like this has never happened to you. The big boss assigns you what could be a career make or break a project and asks for a plan on her desk in three days. The project is bigger than those you’ve done before and outside your mainstream expertise. You begin by jotting down some action items, then you walk the halls getting input from colleagues and put together a big task list. You crank up your project software, put in the tasks, add a timeline, hit PRINT and voila, out comes a beautifully formatted Gantt chart. Mission accomplished! You send it to the boss and get back an email saying “see me in ten minutes.” You walk into her office, expecting praise for producing such excellent work so quickly. But the look on her face spells trouble. Guess what — you’ve just fallen into the dreaded FATTrap. 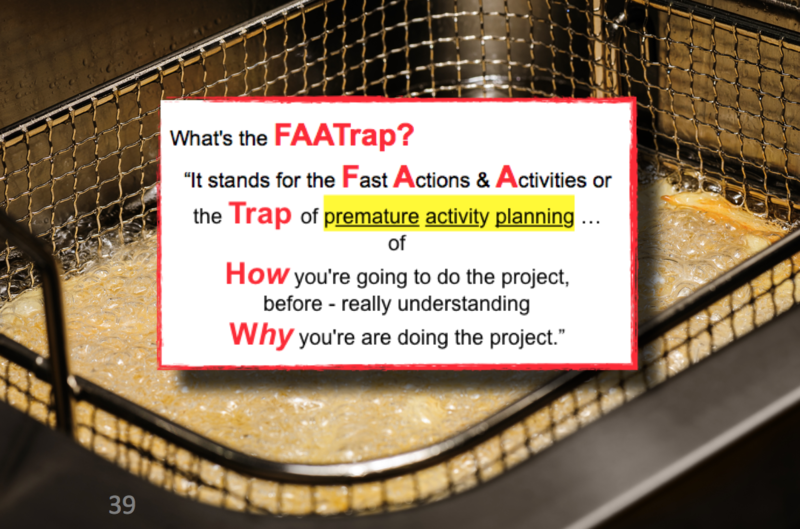 The impact of falling into the FATTrap is predictable — your project gets FRIED. Maybe your career gets fried as well. Lots of tasks, but no clear connection between tasks and the deliverables they should produce. Confusion in implementation, fingerpointing, delay, and wasted resources. Look, it’s easy to fall into the FATTrap. It’s our default planning approach due to time pressure and lack of a simple planning language that gets everyone on the same page quickly. We want to get the plan done ASAP, get it off our plates, move onto something else. And there is nothing wrong with task lists and Gantt charts – we need them for implementation. The problem is when they are developed out of sequence – before we have a clear understanding of the causal connections from activities to deliverables to the goals. Gantt charts and other action plans answer the question How Do We Get There?, but skip over the 3 Cornerstone questions that MUST be answered first. Give your projects a fighting chance for success. Become a Project Super Hero with a reputation for delivering project results, not excuses. Plan them right – from the start. To learn the 4 Cornerstone Questions that eliminate the FATTrap and result in bullet-proof project plans, click here to register for my one hour Project Super Power System training at no cost. Terry Schmidt is a business strategist, keynoter, author of Strategic Project Management Made Simple, and chief honcho at ManagementPro.com. He helps leaders at all levels to develop the skill set and mindset to accomplish outstanding results.